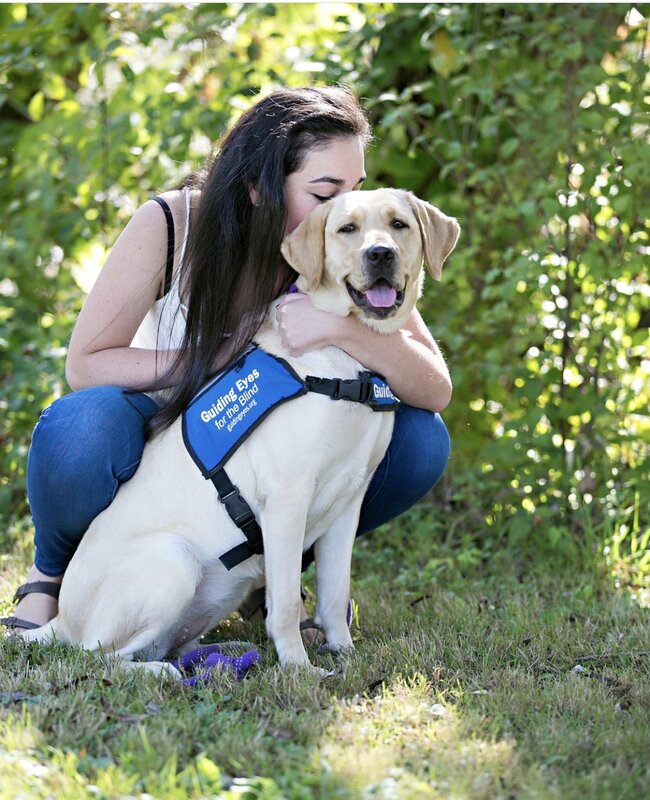 Senior Julia Schayes’s passion is working with animals and she demonstrates her love by volunteering with the nonprofit organization Guiding Eyes For the Blind. Schayes found the organization through the internet after seeing a service animal ad in a restaurant. “It seemed like a cool thing to do and it was for a good cause,” said Schayes. Guiding Eyes for the Blind is an organization based in New York City that has been around since 1956. The organization has groups of people around the United States who teach people how to train their puppies to be guide dogs. Those who volunteer from Central New York get to raise and train a puppy until they're old enough to be a guide dog for the blind. Training usually takes 18 months. Schayes began her journey working with puppies in February of sophomore year. “I thought it was a great opportunity since I want to become a veterinarian,” said Schayes. She has worked with one puppy since and is currently training her second. Both puppies were Labradors because Guiding Eyes for the Blind only trains German Shepherds and Labrador Retrievers. After Schayes finishes college, she hopes to continue training puppies. As a volunteer, Schayes goes to classes most days to learn how to train her puppy. The regional manager of Guiding Eyes for the Blind trains them at the classes. Her classes last about one hour and they take place around different locations in Syracuse, such as Shoppingtown Mall. As part of the training, Schayes brings the puppy everywhere she goes and teaches it to behave around strangers. Schayes has many responsibilities in order to train her puppy. She must train it to not jump on strangers, how to walk in stores, and to not scavenge things on the ground. “I also have to train it to do simple commands like sit and stay, which isn’t as difficult,” said Schayes. Schayes feels good about being able to help others by training puppies. It takes a lot of commitment and responsibility to take care of a puppy. Part of the responsibility is caring for the puppy even during inconvenient times. Schayes spent a lot of her time caring for it, even though it affected her life at home and in school. “I was up until 1 and 2 a.m. all of the time last year because I had to do my homework and take care of the puppy,” said Schayes. Schayes also has to train the guide dog how to get along with other animals, and although her own dog, an Iran Shih-tzu, do not get along very well right now, Schayes says that it “is something we are working on now,” said Schayes. In hopes to become a veterinarian, Schayes is enrolled in physics this year. Physics teacher Elise Jutzeler said that Schayes “is an all-around awesome person and a very hard worker,” said Mrs. Jutzeler. Over the 18 months Schayes is responsible for the puppy, she grows a strong connection with it. Schayes was very sad when her previous puppy had to part from her. “I didn't think it would be as sad as it was, but it was very sad,” says Schayes. When Schayes leaves for college, she plans on leaving the puppy with her parents if she can’t bring it with her. “You get really connected with the puppy so it’s hard when you have to leave it,” said Schayes.